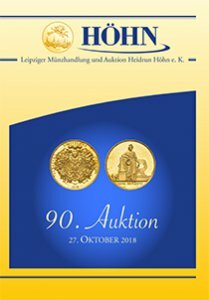 This Bid Inside website is dedicated to Leipziger Münzhandlung und Auktion Heidrun Höhn e.K. auctions. 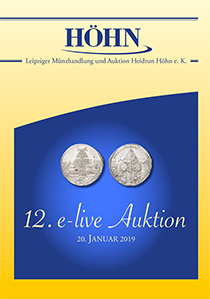 Here it is possible to view the auctions catalogues and place online bids on active Leipziger Münzhandlung und Auktion Heidrun Höhn e.K. auctions. In order to place Your bids You have to fill the registration form. Sunday 20 January - starting at 10:00 AM CET. Absentee bids deadline: Sunday 20 January at 9:00 AM CET. Victor´s Residenz Hotel Leipzig - starting at 10:00 AM CET. Please note: this website is for absentee bids only. You have to be registered to bid. For this auction there is NO LIVE BIDDING service.